Mood board: With every single one of Chanel’s 2,500 guests sitting front row this season, egos were not only quelled but the eyeballs of the audience were also gently massaged. The close proximity gave guests the unique opportunity to ogle Chanel’s fabulous workmanship up close: from the dizzying colour patterns on the boxy tweed suits, amazing glitter flecked boucles on coats, gold stitched quiltings on capes, and crystal crusts on wool kick skirts, every detail came into razor sharp focus. 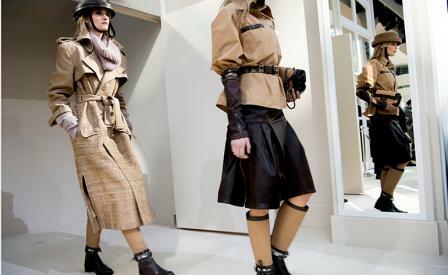 Best in show: As usual, the Chanel show provided a supermarket’s worth of great merchandise. Some of our favourites included fabulous denim tunics belted over tweed suit separates and a great charcoal grey segment in heavy wool, including sleek coats with side flaps that gave the girls a strident look. Finishing touches: Loads of Chanel’s signature pearls were roped around the models’ necks, while heads were topped with funny hats that looked like dog bowls turned upside down with pearl snap chin closures. Knee length boots, meanwhile, were the season’s no nonsense footwear with open hole ankles stitched together with leather lacing.